Version 1.3.5 is a minor update adding two new file formats that can be parsed and plottted. One is output from the popular flight simulator X-Plane (www.x-plane.com). DatPlot can read the output file generated by either version 9 or 10 of X-Plane. Several engineering companies use X-Plane for early simulation purposes and the need arose to plot X-Plane generated data in DatPlot. In this case, each minus sign or dash represents a single space character. Regardless of the number of spaces, DatPlot strips them and parses the file accordingly. Obviously the same number of columns must exist throughout the file for the parsing to succeed. Over the last few weeks, I’ve received several emails from DatPlot users with both bugs found and ideas to improve DatPlot. I greatly appreciate all the feedback! I have to admit, DatPlot has been on the back burner for the last six months due to another project I’ve been working on. But with the idea and bug list growing, I plan on getting back into the DatPlot code and adding new features over the next weeks. At this time I cannot promise that all these ideas will make version 1.4, but I hope to include them all, as they are great ideas. I cannot promise a time frame for version 1.4, but my tentative goal is within the next couple of months. Initially, I envisioned DatPlot as an engineering tool to easily plot strip charts. But based on users’ feedback, I’m starting to see that they are also using DatPlot as a single pane plotting tool and want some features found in MS Excel or similar tools. I hope to add such features as much as possible and as much as they make sense. Thank you all for using DatPlot! Second bug fix in a short time. I wish they weren’t required in the first place, but I’ll squash them as they are found. A user made me aware of a problem when using time based x-axis and the Data Swap feature (thanks Guillermo!). If a time based x-axis parameter was used, DatPlot crashed when swapping input data. Version 1.3.2 fixes this bug. It can be downloaded from the Download page. I was on vacation last week when a DatPlot user made me aware of a bug that was introduced in Version 1.3. When removing a curve, DatPlot crashed. Not a good thing at all. Back from vacation, I determined what the problem was and squashed the bug. I also fixed an error introduced in Version 1.3 which did not allow intersection data export anymore. Version 1.3.1 is now the latest version of DatPlot. If you are running Version 1.3, please update to 1.3.1 to avoid this bug. Many thanks to Claude for making me aware of this bug. Version 1.3 of DataPlot is now available. It includes a new feature and a bug fix. Version 1.3 allows the user to show or hide an information box in the upper right corner of each graph pane that displays the minimum/mean/maximum point values for each curve in the pane. This feature is accessed via the menu (Edit > Toggle Min/Mean/Max) or via the keyboard shortcut CTRL+M. Note that only the points visible on the graph pane are used to calculate the min/mean/max values. Any points of the curve that are not visible on the pane are ignored. In addition, with Version 1.3 it is now possible (again) to swap data once a saved plot file has been opened. This was the originally intended functionality, but was broken with Version 1.2. It’s been a while since I posted an update. Both to the blog and to DatPlot. Truth is, I’ve been busy with bill paying work. But it looks as if I’ll have some time in the near future to dedicate toward improving DatPlot. As mentioned in previous posts, I hope to add multiple Y-Axis capability. Some people like to just have one plot showing all their data instead of using strip charts. But to support a larger number of data parameters, it would be handy to have multiple Y-Axis on the left and right sides. I plan on getting back into investigating such an option. Another idea I have for DatPlot is to support contour plots. Meteorology is a hobby of mine, and I love weather data contour plots. I think DatPlot would also benefit from supporting contour plots. Comments Off on Where’s The Next Version? As mentioned in a previous blog post, DatPlot V1.2 significantly changes how the DPM file format is structured. In addition to saving the actual plot data, all data in the data table is now saved as well. The DPM file is now fully independent of the original source data file and the DPM file is fully portable. It also means that DPM files opened with V1.2 are automatically updated to the new file format. In other words, if you open a V1.0/V1.1 saved DPM file in V1.2, your old DPM file will be replaced with the new DPM file format and you will not be able to open the DPM with V1.0/V1.1 anymore. Besides this change in DPM file format, the two new additions to DatPlot V1.2 are time/date formatted X axis and pasting new data into the data table. Starting with version 1.2, DatPlot allows the user to copy column data from an external source, such as an Excel spreadsheet, and paste the data into DatPlot for plotting. This is often desired when additional parameters are calculated from the source data file in Excel and those calculated parameters need to be plotted along with the source data parameters. In this case, the user can perform all calculations in a spreadsheet and simple copy/paste the calculated column values into DatPlot for plotting. Note that only a single column at a time can be pasted into the data table (no data block paste support). Also, if the pasted data contains more rows than the data table contains, only the number of values corresponding to the numbers of rows are pasted. Finally, if DatPlot is closed after new data was added without saving a DPM file, all new data addition is lost. For more information on how to copy/paste new data into DatPlot, please refer to the DatPlot help file under the entry How To Paste New Data Into The Data Table For Plotting. 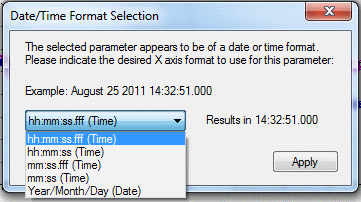 The time/date format change allows a user to import Excel formatted time/date data and use this parameter for the X axis. This will enable users to display time scale on the X axis using HH:mm:ss.fff, HH:mm:ss, mm:ss.fff, mm:ss, or Year/Month/Day formats. For some users, this is the preferred display format rather than showing a time axis starting at zero. The ability to paste external data into a new column was added because some users perform calculations on their data in Excel and would like to plot the results. Now you can perfom such calculations in Excel (maybe dependent on your data source data), copy/paste the results column into DatPlot, give that new parameter a unique parameter name (important!) and then plot it in DatPlot. Finally, I was never 100% happy with the need to keep the source data file around to load a DPM file. Even though I don’t like data duplication, I decided it was necessary to save all data displayed in the data table to the DPM file. Especially now that you can add new data columns to the data table. This required a new format for the DPM save file. Version 1.2 will still open DPM files created by V1.0 or V1.1. But after telling DatPlot the location of the source data file, DatPlot V1.2 will automatically update (read: overwrite!) the existing DPM file and save it using the new file format to include both plot and all numeric data from the data source file. Obviously this results in a larger DPM file size. It also means that you will not be able to open a DPM file saved with V1.2 using V1.0 or V1.1. But since V1.2 file format is the way forward, I’d rather get all older DPMs converted now (no, I do not leave you a choice to keep the old format). The benefit of this new format is that DPM files are now fully portable and do not rely on the data source file anymore. Email a DPM file to your colleague and they will be able to open up this file provided they are using DatPlot V1.2 or later. I hope to release V1.2 by mid October, depending on how testing goes. After only four days of launching DatPlot, I decided it was already time for version 1.1. Not due to any bugs submitted, but due to a couple of annoyances I came across and the desire for DatPlot to be a little more in-your-face about checking for updates. Since I hope to update DatPlot every 6-8 weeks, depending on workload, feature suggestions and required implementation time, I decided there had to be some mechanism to prompt the user to check for updates. With version 1.0, you could manually check for updates (Help > Check for updates), but I wanted DatPlot to do its part to periodically remind the user. I decided not to go as far as perform update checks in the background every time DatPlot launches, mainly because there are likely users behind corporate firewalls who may not have access to the internet. As the prompt states, the user can easily disable this reminder in the Options settings, if desired. Since the reminder occurs only every 4 weeks, I would recommend against doing that, however, so you will be running the latest version of DatPlot. Two other improvements were incorporated into version 1.1. Previously, if data was plotted and the user selected Open Existing Plot, the plot was cleared before the user could select a DPM file to open. This could lead to accidental loss of the currently plotted data (loss of work!). Now DatPlot will not clear the plotted data until the user selects and opens another DPM file and therefore leaves the user a chance to cancel out of the Open DPM process without losing work. Finally, the prompt shown when loading new source data (and now also when opening an existing DPM file) was reworded to more clearly communicate to the user what is happening using a simple Yes/No question.